On the first day of a new place, everyone is excited. The sites and sounds are fresh to everyones eyes and there is always a feeling of myrth. 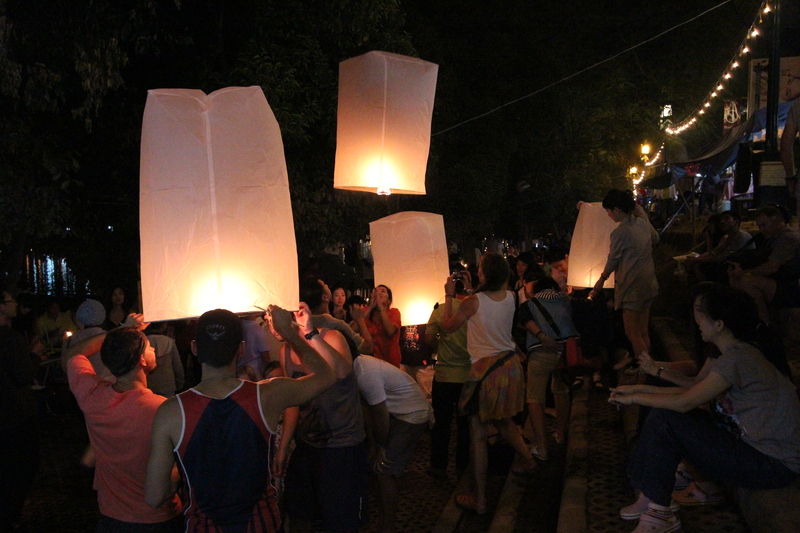 Chang Mai in northern Thailand has been no exception. Golden temples, a rich and impressive artistic bent, and AMAZING food make this area super interesting to explore (and as an added blessing it’s cheap!). This area had some flooding about a month ago but it was not as hard hit as further south, or as bad as Bangkok is getting it now. 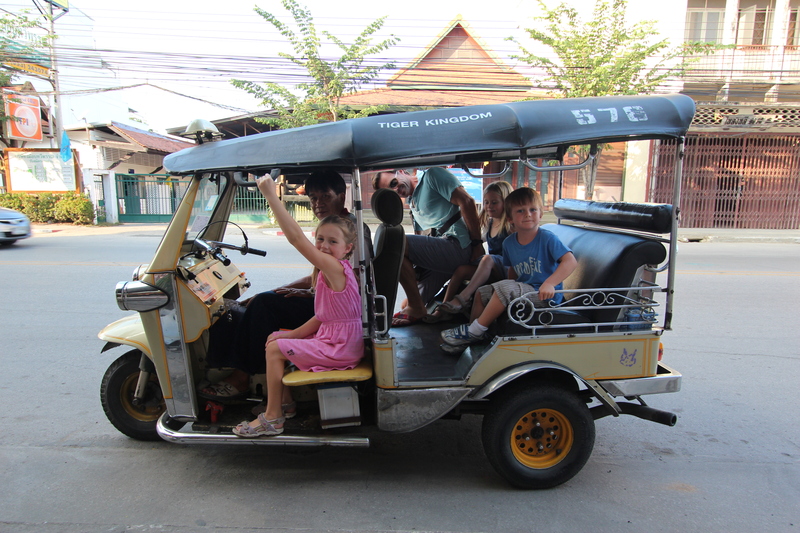 We had a direct transfer in the Bangkok airport to Chiang Mai and fortunatly didn’t need to go into the city at all. 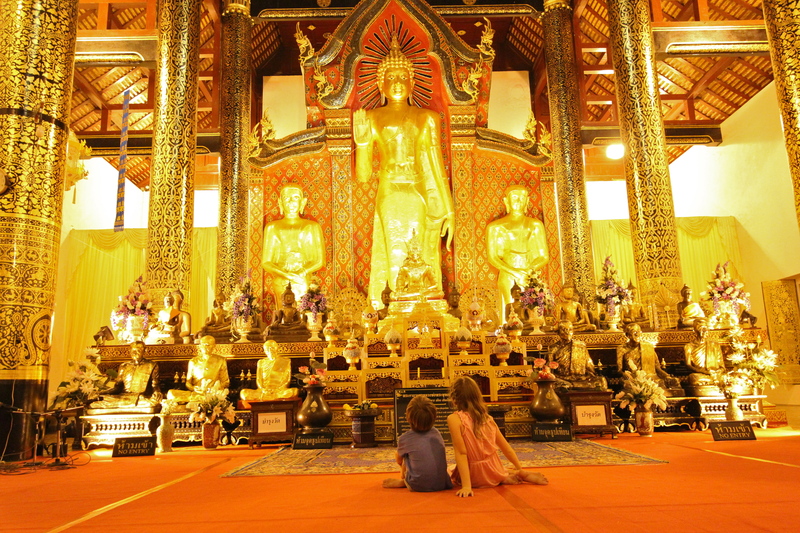 The inside of a Wat (Buddhist temple). 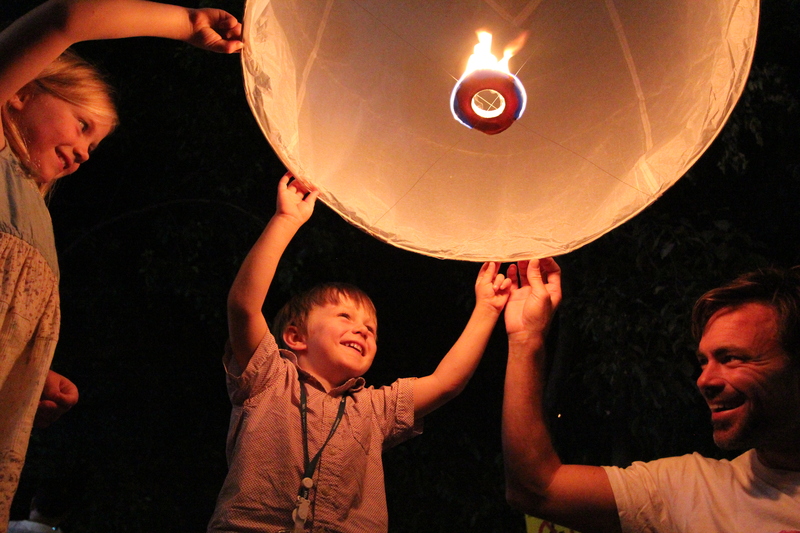 The Thai people are so smiley and happy and they LOVE kids. I have never had such a good time going through customs. Smiles and giggles. Everyone wanted to hold the kids hands, pat them on the head, or hug them. A little hard to get used to as a stiff Canadian! Here in Thailand, everyone thinks Ashton is just wonderful and he is clearly the favorite of the group. He’s not really used to the attention (usually reserved for his sisters), and his new nick name has become ‘the prince of Siam.” He even gets his meals served first! It hasn’t been hard to move around with the kids, and fact, if anything they like the change of scenery. The bizarre become normal very quickly for them but somethings are always super exciting, like ridding in the front seat of a tuc tuc. A ride into town for six. Don and I have both taken turns having our bodies contorted by a nice lady who gave us a thai massage. I’d never had a thai massage, so the quick synopsis is that a tiny woman pulls and stretches your body with her legs, knees, and elbows. She didn’t speak any english but she didn’t need to. 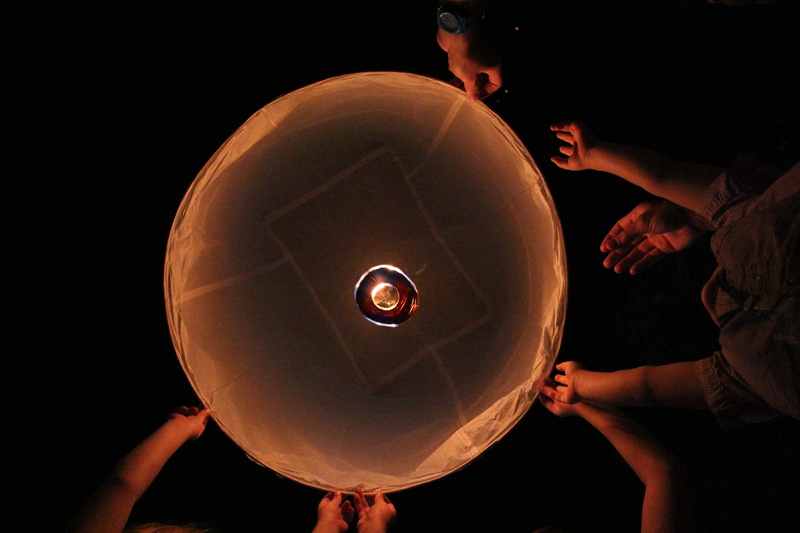 It felt a bit like being contorted in to a prezel, but in a good way. It made me realize two things: #1 I need to do more Yoga, and #2 I need to do more yoga! 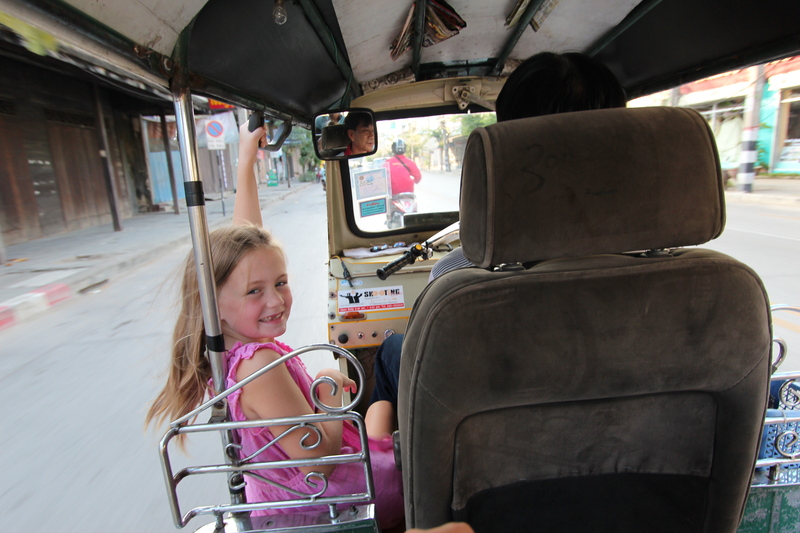 We took a small van to the elephant nature park, not really knowing much beyond the fact we were going to be seing some elephants. This would be our second time seeing an elephant, the first being in the Tokyo zoo. That had been a rather sad place and I was hoping that this mission would be much better. 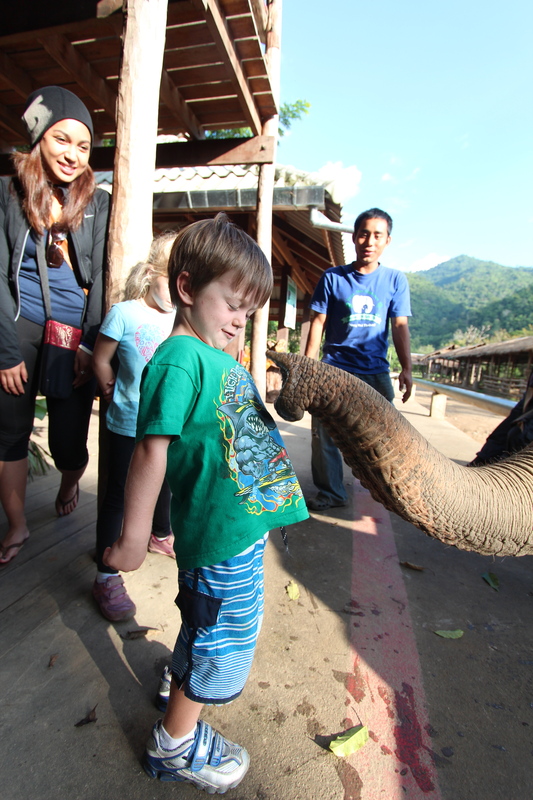 The elephant nature park was one of the most magical places that I (we) have ever been. 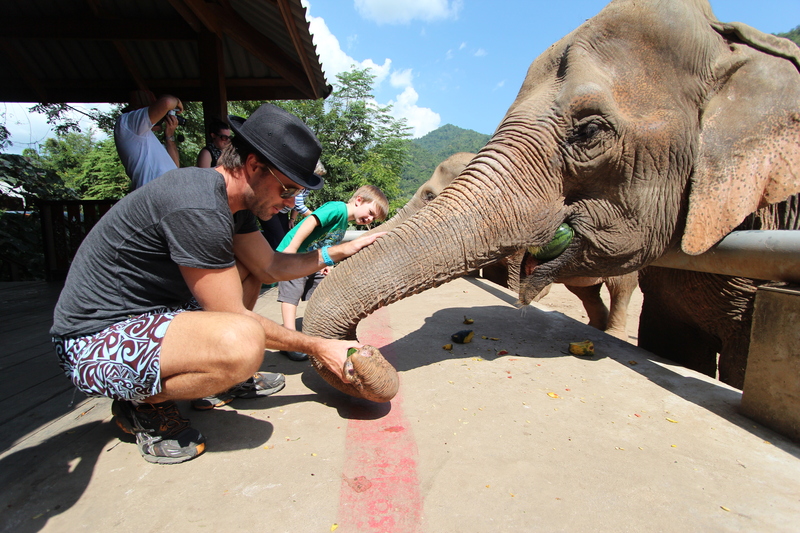 They have over 30 elephants, of which many, we were able to touch, wash, and feed. 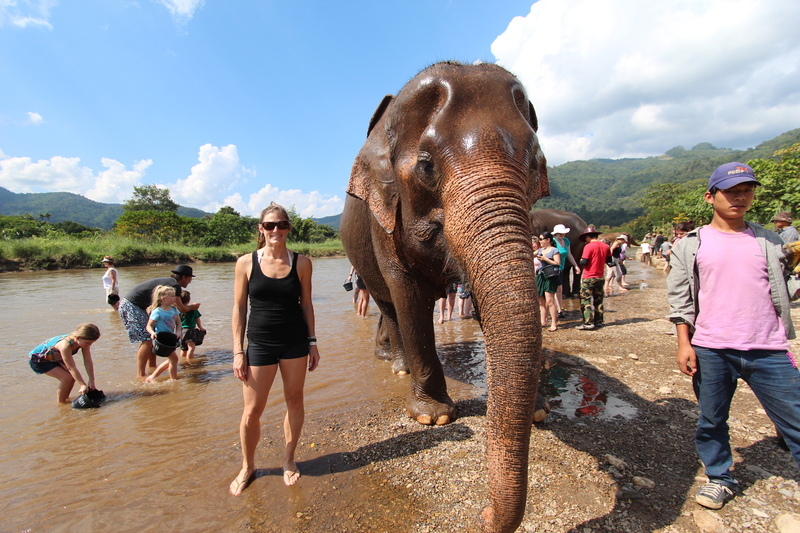 There is something magical about being close to the largest land animal on earth, let alone that giant trunk! 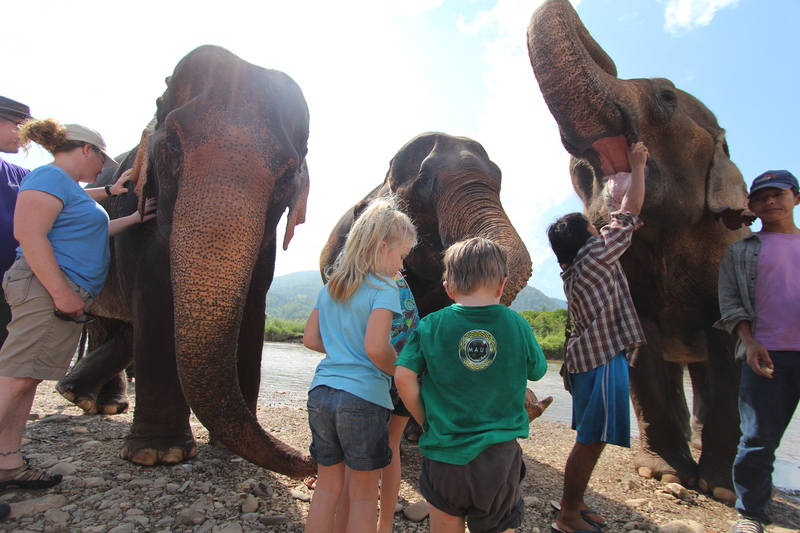 Lek, the owner and business woman who founded this this sanctuary has made it her mission to save Asian elephants from street begging, elephant treking, and cruelty to elephants through logging. It is a hefty undertaking and her passion is amazing! Here are some photos of our trip. It was so truely touching and sad, that words are hard to describe it. 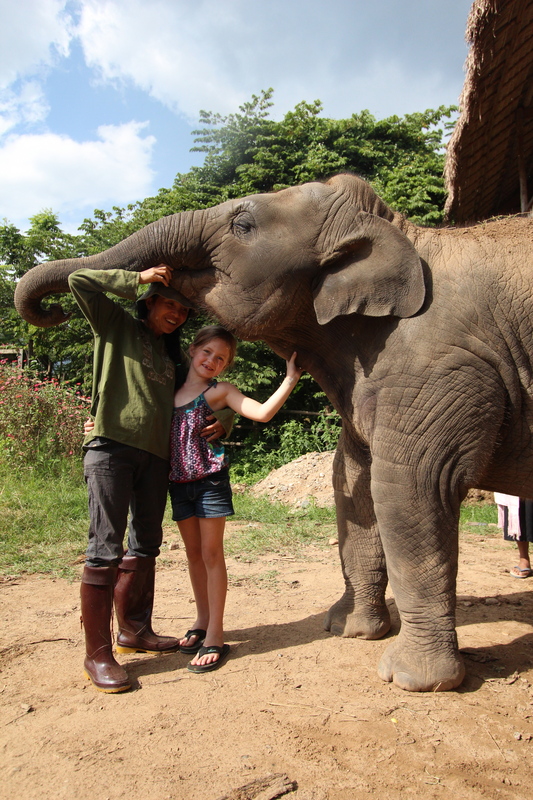 Lek and her mahouts (elephant trainer and keeper) are pioneering a more enlightened approach to teaching young elephants by using positive reinforcement instead of pain. 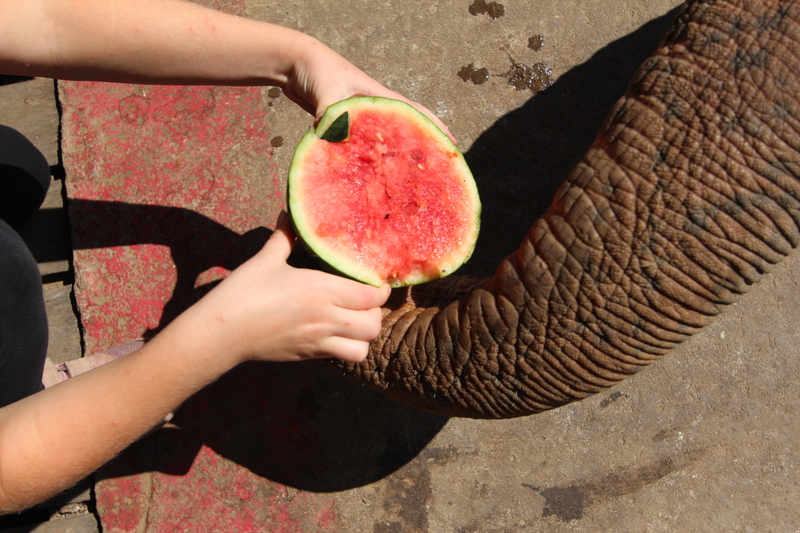 The elephants eat over over 200lbs of food a day. They need a lot of calories to move their giant bodies. We fed them squash, watermelon, and bananas (thier favorite). They also graze on grasses. Most of these elephants are older (40-70 years old) and have some major injuries sustained from a life of hard labour. They have an incredible ability to forget human cruelty. They walk very carefully and quietly,and are surprisingly nimble. 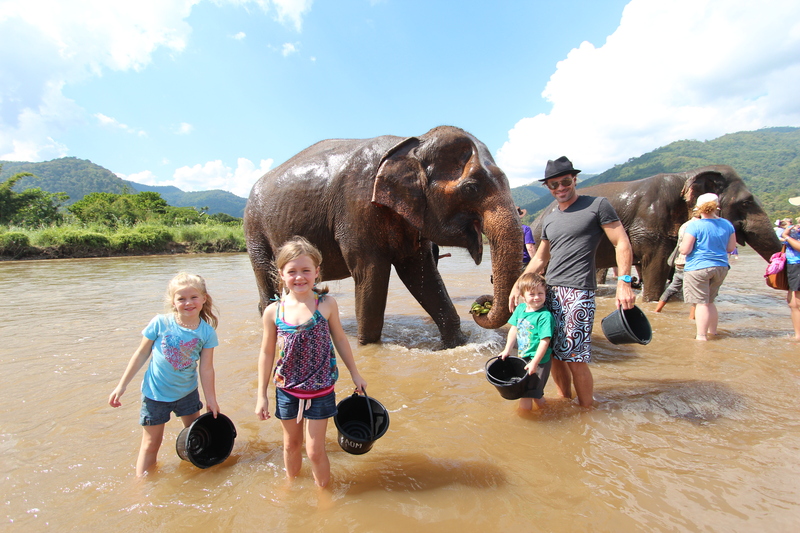 The elephants love a bath in the river. Some love to spray themselves on the heads, some wade into the shallow river and roll around, and others prefer to be splashed with a bucket. There are currently more than 30 rescued elephants living at the park ranging from calves to grand old matriarchs over 80 years old. 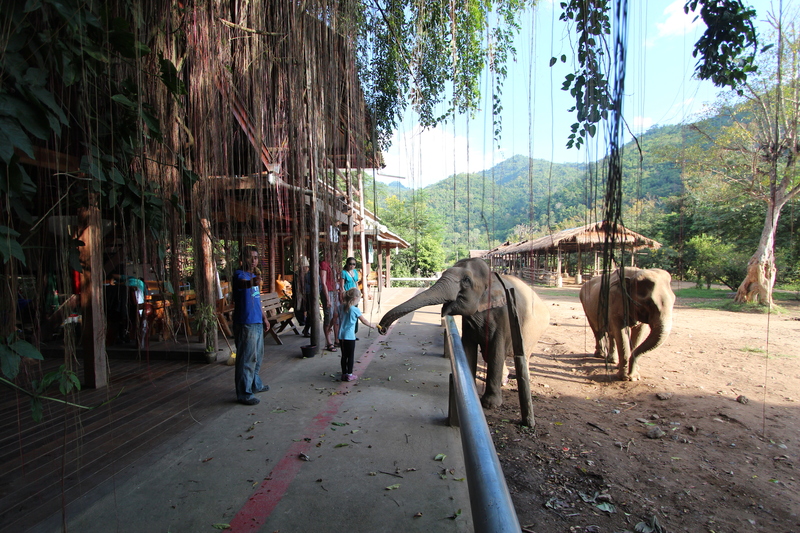 The elephants at the park are free to choose a family and form small herds. They are not expected to work or perform, they feed at their leasure, bathing in the river, and play together in the mud pit. We stayed overnight in a simple hut but it’s also possible to go for the day. 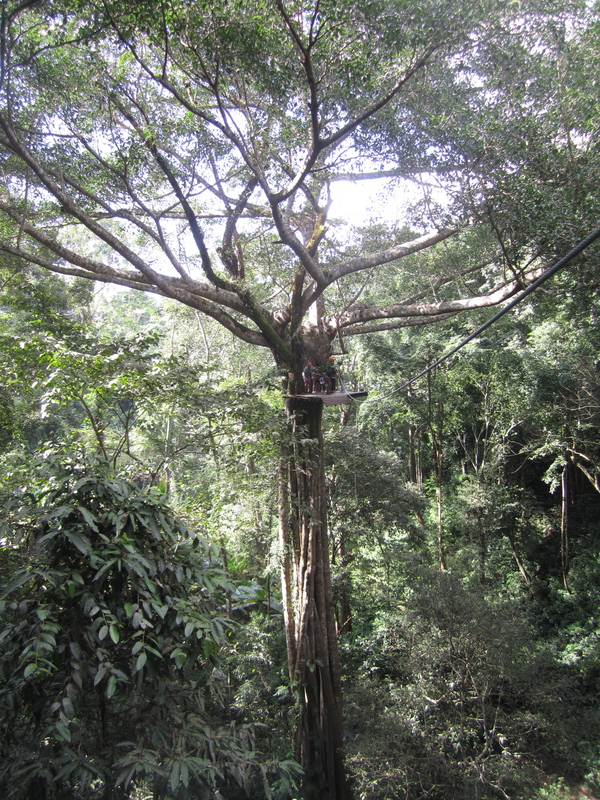 Zip lining: What can I say? 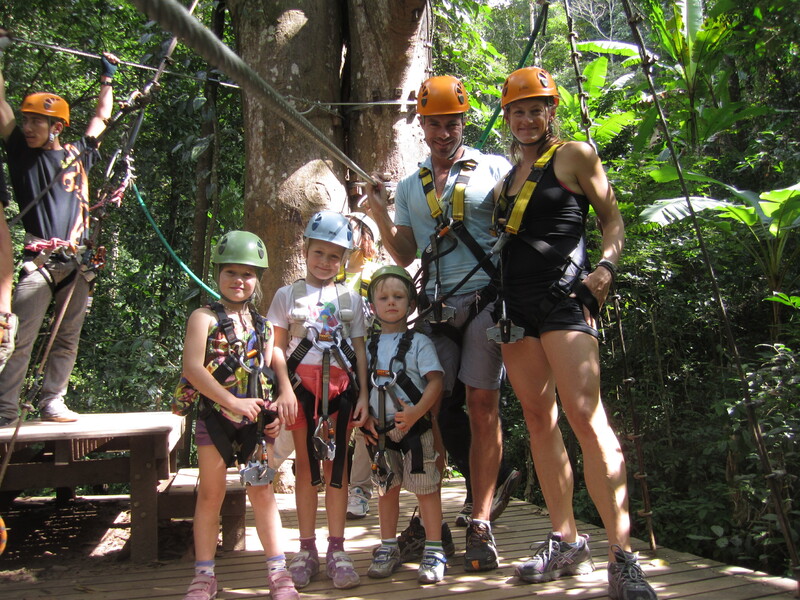 Watching your four year old fly across a ravine 200ft in the air….very excilerating. It took about six lines before I could stop shaking! 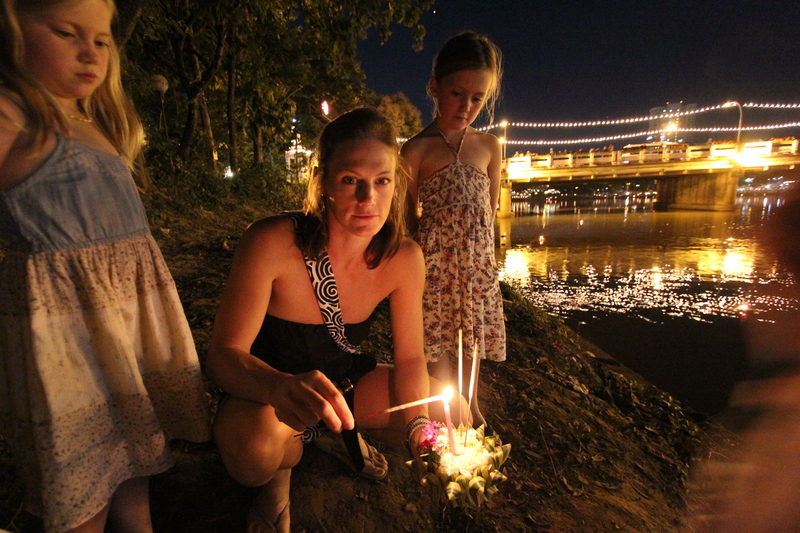 We just happened to be in Thailand for yi peng, a festival that clebrates the river by thanking the river goddess for providing life to the fields and forests and asks forgiveness for the poluting ways of humans. 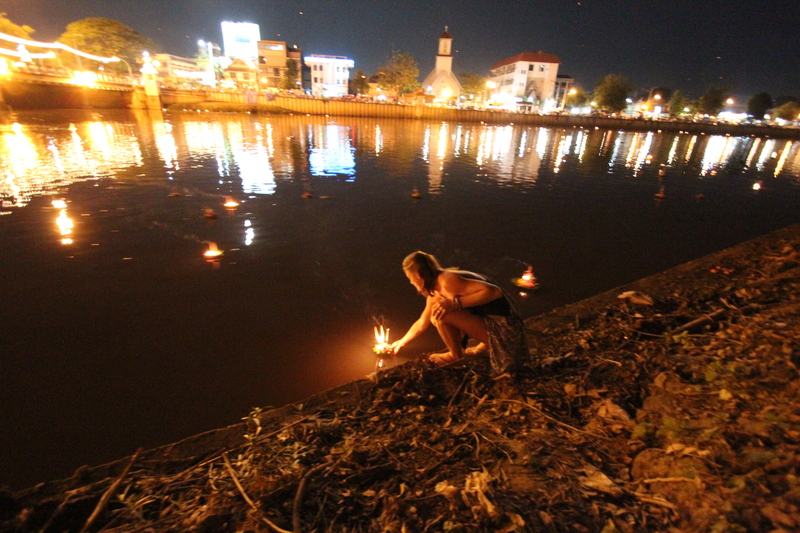 Small handmade boats (krathong’s) are lit and sent adrift in the river and lanterns are launched into the sky as a way of sending away bad karma. Visually astounding. Jo, I think I see a project…. 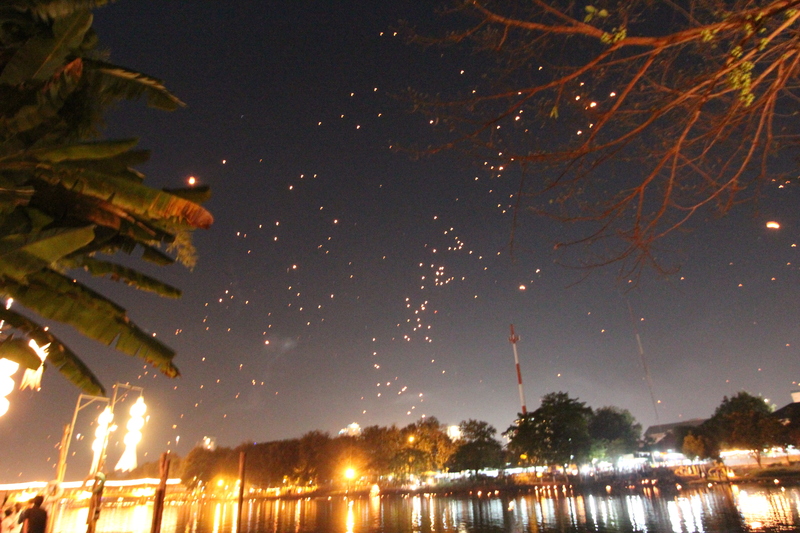 There were thousands of lanterns that lit of the sky in creating an incredible starry night and the sound of near constant firecrackers and fireworks. Today we are in Chang rai relaxing, before heading out tomorrow to the Lao border and the Mekong river for two day boat trip. Now therse are truly amazing experiences. 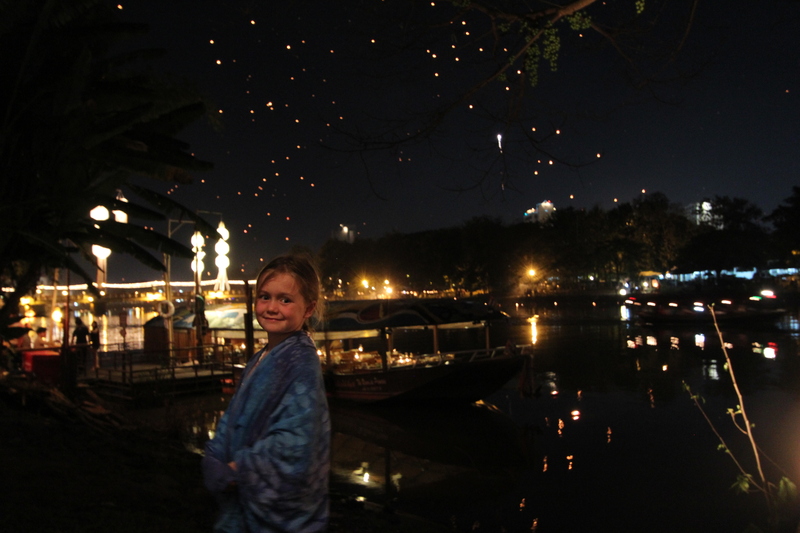 The candle boats, the lanterns, the elephants. It is exciting (for us old people) to wait to read the next episode! Jess you are a very good writer. Gwen are you growing a lot? You look SOOO tall. 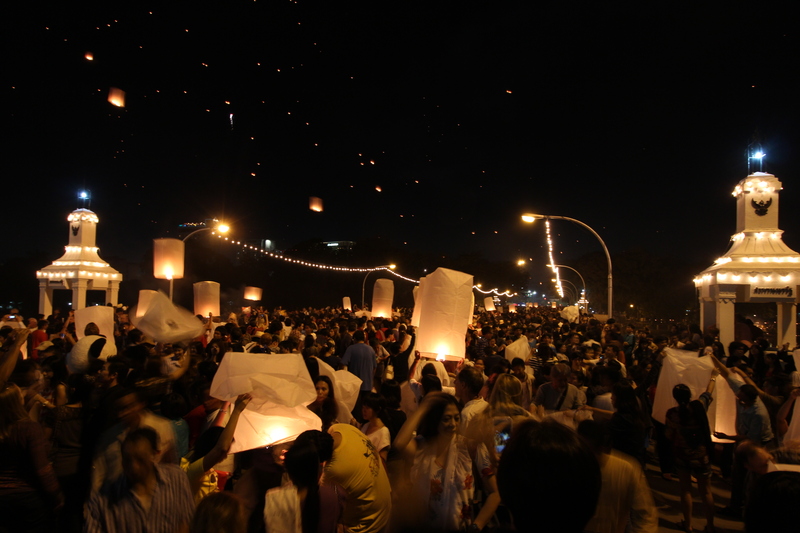 Now we have to add Thailand on the bucket list. Great experiences so far and so much more to come. Beats real schooling I think. Enjoy….everthing. Wow, what an experience. Your pictures are stunning. Can I say jealous. You all look so happy and healthy. Keep taking it all in and thanks for sharing.